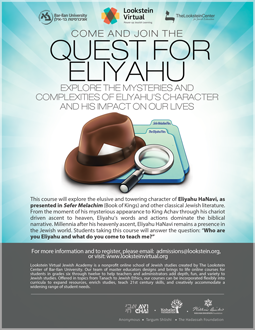 This course explores the elusive and towering character of Eliyahu HaNavi, as presented in Sefer Melachim (Book of Kings) and other classical Jewish literature. From the moment of his mysterious appearance to King Achav through his chariot driven ascent to heaven, Eliyahu’s words and actions dominate the Jewish tradition. After all, Eliyahu appears in the weekly havdalah ceremony, at the Pesach sedar, and at the brit milah ceremony. 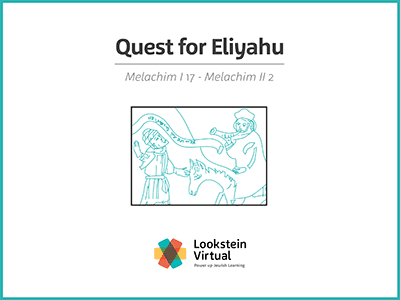 This course asks: “Who Are You, Eliyahu and What do you come to teach me?” (Course texts: Melachim/Kings I 17:1 – Melachim/Kings II 2:25, relevant texts in Malachi and Divrei Hayamim/Chronicles, Talmudic excerpts, and Hasidic stories).